The name "Delving Hills" given to this skin refers to the Shire obviously, as this skin tries to emit the homely athmosphere from the Shire Folk. - 6-year Anniversary portraits (player, selected player and fellowship member). - War-steed vitals' glow tweaked. - stuff that was "turned off" due to Update 10, like box rims and backgrounds. - Yule Festival portrait (better late than never). 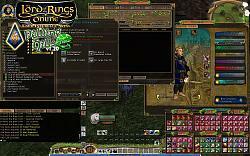 -- Smaller LOTRO Store button. -- Position adjusted to circumvent the bug that renders buttons unclickable if the scale is not adjusted in the settings. This needs to be manually adjusted in the SkinDefinition.xml file to suit your screen resolution. - The graphic files of the old version of the small mainbar with the long xpbar is included if the small XPbar is not desired. Some code lines that are marked for the small XP bar in the SkinDefinition.xml file need to be removed then. - MC mainbar: For now the same as the normal mainbar, a more distinctive bar is in the planning. - Great River and Rohan Tabs in Deed Log. - Anniversary portraits for Monsterplay characters. - The two display buttons on the vault UI. - Pop-up quest offer button. - Mainbar. Buttons on the right side were moved a little to make room for the quickslot page buttons. - When using the small mainbar version no buttons (apart from docked skill bars) can be used until the scale is changed to anything other than 1.00 in the options menu. Hopefully this will be resolved soon. - Inanimate object target vitals (target's target). - Quest information panel decorations. - Mainbar updated for the extra button. - Removed trait pips; no longer supported by the game. - Added 4-year player portrait for fellowship member (forgot to export it last time, oops!). - Anniversary portrait vitals (show off your status in style!). - Vault textures (observant users would have noticed that with previous version most of it was already there). - Trait panel errors are fixed, some textures didn't show up (thanks to Adra for pointing them out, made it easy to fix!). 4. All images and the skin definition files will be inside their respective folders if extracted (properly). 6. Once in-game, go to OPTIONS then choose "UI Settings" from the menu on the right, once there scroll down to just above the new UI scale sliders to the UI Settings page and you will find a dropdown list where you can choose the UI Skin to use for that character. P.S. 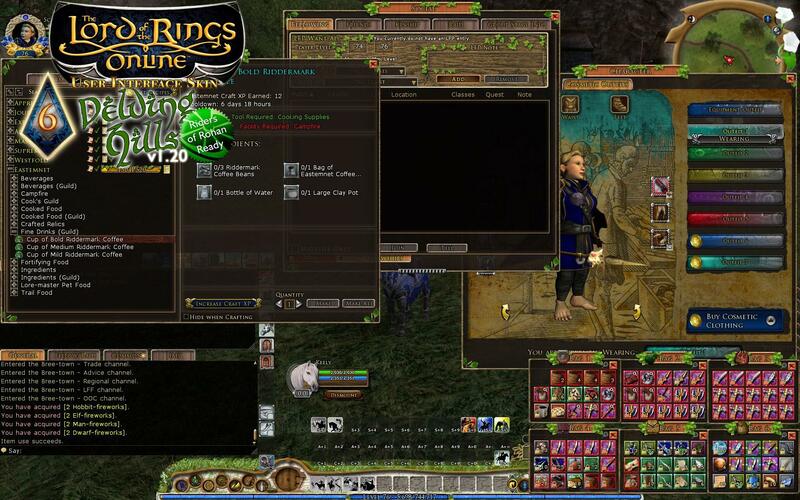 At first use, you will need to restart the LOTRO client in order to let the position and size changed to take effect. P.P.S. With using the the small mainbar version, you might have to change its position if you're using a different resolution than I do (instructions are in the SkinDefinition.xml file). Good day, tell me why a simplified cover does not start properly and are not pressed with the mouse no 1 skill panel of skills that goes with the cover. And full cover works fine but I want more places to save. I've been neglecting the updating a little bit. I'm terribly sorry for that! I'll try to make up for it Soon™! Any chance of getting unique accomplishment tabs for the road to erebor and wildermore? I edited my UI to use ered luin gfx for erebor and forochel gfx for wildermore in the meantime to get rid of the default ones. Beautyfull art work. It really brings back that merry feeling that only The Shire have. Will love to see the frame for VIP portrait as have been done for yule & years 1 to 6. Delving Hills: needing an update for LU10? Hello, just curious, will the skin need an update due to today's client update, LU10? This is the one I make and maintain. Adra copied some of my stuff and gave it his own twist, with my permission. Last edited by Wicked Mouse : 10-31-2012 at 01:50 PM. What's the difference between this Delving hills and the Delving Hills in JRR Skin collection? Alright, I figured that the bug can be circumvented when the position of it is set within the bounds of the screen resolution. So to position it at the bottom of the screen in the middle, the right x AND y values have to be manually set in the SkinDefinition.xml file. I really wish that for this thing Turbine would allow the use of percentages. Last edited by Wicked Mouse : 10-30-2012 at 11:27 AM. Basyiat1, currently one cannot make changes to the mainbar without running into that problem that one cannot click anything on it. I mentioned this under "known issues" above. The workaround for this would be to scale it up or down a little bit in the UI settings. I hope the devs will fix this soon. Wicked, your work here is really incredible. I love to use the skin while leveling, but when raiding I really like your "Small Mainbar" setup. Any chance you will update that one for Rohan also? The sixth bag added a stray button whereas you had removed all the others, and for some reason you can't click anything on the botton bar, the menu button, or the store button. Be well! Last edited by Bastiat1 : 10-27-2012 at 12:58 PM. Just keeps getting better, love it.